Feb 2015 – We screw open the cap on this misleading drink. wotwine? was started because we wanted to give some transparency to the process of buying supermarket wine, unearth some hidden gems and give some power back to the consumer. Recently, we unearthed an interesting product which caused quite a stir within the tasting team. Our tastings are conducted blind; the tasters only knowing the country of origin, appellation and vintage. Before Christmas we came across some poor, rather dilute red and white products from Australia, which our tasting manager bought from supermarket shelves believing them to be Australian wines. Some of the wines were passable just lacking genuine character and dilute, whilst others were unpleasant, not genuine, contrived and manufactured tasting. On later revealing the labels we noticed that in small print on the back label these products were termed “Wine Based Drinks”. The fact that we had been misled into buying them as wine led us to do some more investigation. There are three brands we have tasted, Copper Red (and White) at 12.5% alcohol being sold by Sainsbury’s, Umber (again Red and White) was on Tesco’s shelves but has now been withdrawn, and Shy Pig Red and White at 11% and 10.5% alcohol respectively, being sold by Morrison’s. All these wines are made by Australian Vintage Ltd., a large and innovative producer who own a number of wine brands including, most notably, McGuigan in the UK market. All these wine base drinks are shipped in bulk and bottled in the UK. Our researches found that in Australia the Industry Rules (Australian Grapes and Wine Authority Compliance Code 2014) determine that to be called a “wine based drink” the product must contain a minimum of 70% wine. There is no requirement to list what the other 30% is, but there is a requirement for the alcohol content, bottle size, if it contains sulphur dioxide as a preservative and other allergens, (for instance milk and eggs), to be shown in clear view on the label and in a stipulated size of print. Last year, mainly in response to government encouragement to produce lower alcohol products and following legislation for aromatised wine based drinks, the European Industry body OIV (International Organisation of Vine and Wine) issued guidelines broadly along Australian lines, but with a minimum of 75% wine and again no requirement (apart from SO2 and allergens) to list what else is in the product, be that water, partially fermented grape juice, colouring or anything else. We contacted the Food Standards Agency, the UK Government body now responsible for implementing controls and legislation for agricultural products including wine, to clarify the position. We were not primarily concerned about the legality of such products as on the surface they conform to some pretty vague labelling regulations, but more concerned that the consumer is being misled into believing that these products are wine. They are merchandised alongside proper Australian wines on the shelves, Sainsbury’s website lists Copper Red and White as ” Wine of Australia; Wine based drink; Red (and White) Wine”, the products have similar alcohol levels to wines, they are not low strength. Although, the Shy Pig brand benefits by being only 10.5-11% alcohol and it is a better product. They are packaged exactly like wine, particularly the Copper range which talks about grapes and soil types on it’s back label, with Shy Pig being a rather more fun label seen here. The Food Standards Agency, asked for 20 days to give a response as this was a technical question and eventually we were able to have a conversation with them, whereby they stated that as this was an “Alcoholic Food Beverage” and not wine, it really came under the jurisdiction of local Trading Standards. Having contacted a few Regional Trading Standards Offices, they ascertained that there had been few or no formal complaints, and therefore they proposed no action. They further mentioned that they had received some criticism when they investigated the labelling of low alcohol wines, as being bureaucratically obstructive to the promotion of these wines, and in danger of “scuppering the desirable development of these products”. The FSA are therefore loathe to intervene or take any action if neither they nor the Trading Standards bodies have had any complaints. We believe there is likely to be offences, under the relevant legislation both in Europe and the UK, for labelling and selling a product which is blatantly misleading consumers. Our further concern is that we do not believe the sale of such products as wine is good for the industry reputation as a whole, be that wine retailer or wine producer. We do however support the move to lower alcohol. There are also very low or even no alcohol products packaged and sold alongside wines, and maybe the three products we tasted started out as 14% or more, and the dilution with water to get the strength down to 12% is a good thing? We can see the commercial benefit to the producer. They can ship high alcohol wine in bulk, then at no cost dilute with water when it gets to the UK, thus saving on shipping costs and also getting more margin from the shipment, with the per bottle cost of production that much lower. We can see the commercial benefit for the retailer who are selling the Copper Brand at a pretty full price of £6.25 a bottle, whereas in our view the far better product Shy Pig is a fair and reasonable £3.29 in Morrisons. We calculate the cost of production for the Copper brands is between £0.30p and £0.50p a bottle to include liquid, packaging and production, plus £2.05 duty then VAT, so at £6.25 they are making a profit of at least £2 but probably nearer £2.50 per bottle. It is little wonder that it is merchandised in the absolutely prime shelf space alongside their fastest selling wines. So what, if anything, is to be done? Our view is that whilst it is a good thing that producers and retailers are looking to market lower alcohol wines, the average strength over the last 25 years having risen by nearly 2% alcohol. However, we also believe that the consumer should be treated fairly and honestly, remember how the unmentioned addition of horse meat in products marketed as beef crept up on the retail and food industry? We feel that it is in consumers’ and indeed the wine industry’s interest to be clear, honest and transparent about these products. 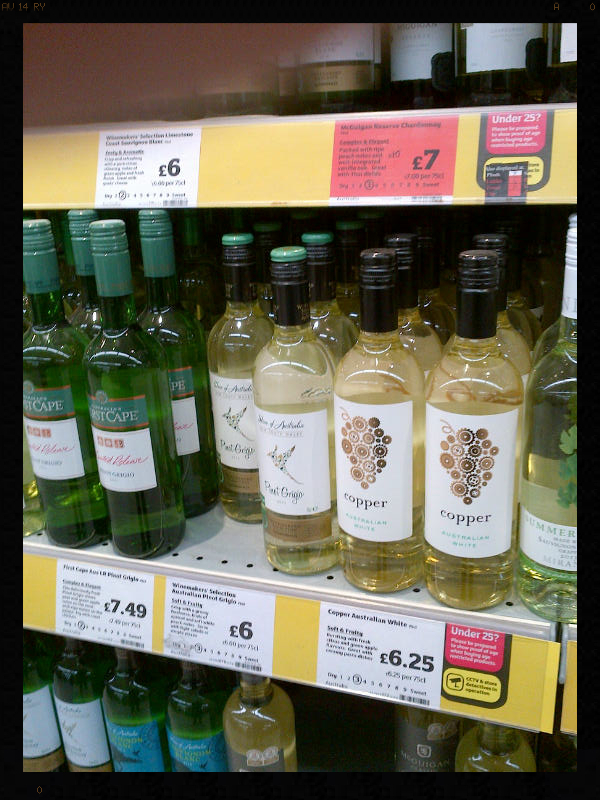 They may have a legitimate place on the shelf, but we feel that the minimum requirement should be that the “Wine Based Drink” designation should be properly visible in clear print probably on the front label, or as a minimum the same size print alongside the alcohol strength and bottle size might be acceptable. It would also seem reasonable for the ingredients to be listed on the back label to show the consumer the actual minimum percentage of wine and other additions. We understand that supermarkets might find it difficult to have another section for these products on their shelves and may wish to merchandise them with wines, but we feel that low strength, low calorie and these drinks might all be best for their customers if merchandised clearly for what they are all together. 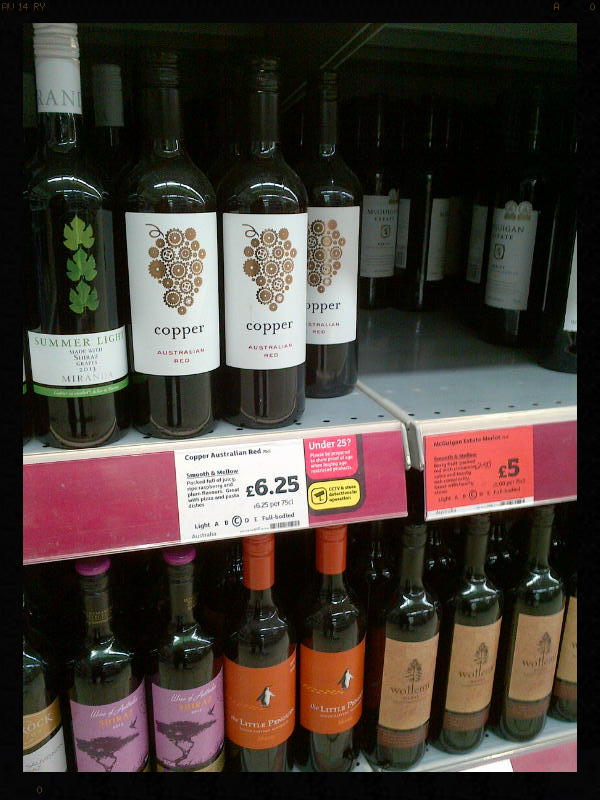 Whilst Morrisons do not use the term “wine” for Shy Pig on their website, Sainsbury’ s do often refer to Copper Red and White as wine. We feel that this is highly misleading. If you feel that these “wine based drinks” are presented and sold in a misleading way, or have tried them and hold a particular opinion you wish to express, let us know at info@wotwine.com. We would welcome any thoughts. Keep using wotwine? and you will discover quality, well made, genuine wines at similar prices to these “wine based” products. We are fully independent and here to raise industry standards and ultimately help consumers increase their satisfaction with the wine they buy.